Albany fishers have just received a boost in safety, with the Minister for Housing; Racing and Gaming, Colin Holt, announcing that a new emergency telephone will be installed at Salmon Holes. Minister Holt received a recommendation from the Gaming Community Trust after Recfishwest submitted a grant application for funds to install an emergency telephone at the iconic high-risk fishing location. Recfishwest Chief Executive Officer Dr Andrew Rowland said approval of the grant is a win for the Albany community and the Government should be congratulated for their continued support of important local safety initiatives. 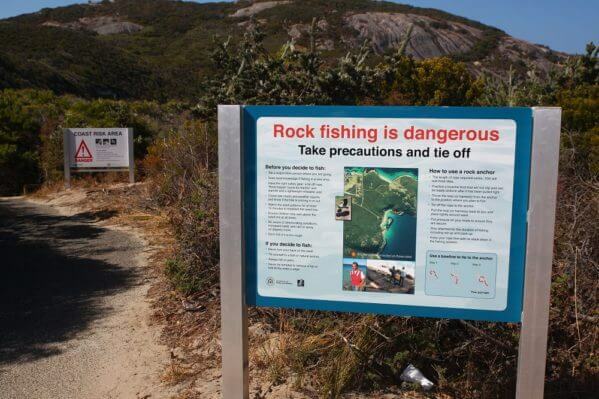 “Salmon Holes has had 12 rock fishing fatalities over the past 30 years and the recent efforts by local community partners has reduced the risk of this number growing,” Dr Rowland said. This new emergency phone complements the state-wide Rock Fishing Safety Strategy that includes the Life Jacket Loan Scheme, the state-wide Angel Ring Program as well numerous education and awareness initiatives. Recfishwest is the effective voice driving positive change for WA’s recreational fishing community.